Anne Cahill: is a graduate of St Nicholas Montessori College Ireland & has many years experience working with children. She holds a primary degree in Education & Training (NUI, Galway) along with a Post Graduate Diploma in Practice Based Play Therapy, awarded by NUI Galway & the Academy of Play & Child Psychotherapy (QQI Level 9). 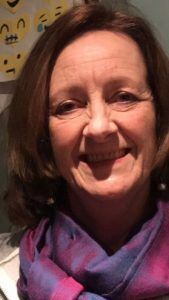 Karel Daly: Karel qualified as a Play Therapist and Psychotherapist from the Children’s Therapy Centre (CTC) (Diploma in Play Therapy & Psychotherapy) in 2011. She is a accredited member of the Irish Association of Play Therapy and Psychotherapy (IAPTP). In the last seven years she has been working in her own private practice with children and teenagers with various challenges. Karel’s experience includes working with children with Autism, Anxiety, Behavioural problems and children who have experienced trauma, abuse, bereavement and loss. She also has extensive experience in dyad work with parents and children. In addition this this she has completed a two year programme in Systematic Constellation Therapy, incorporating the traditional teachings of Bert Hellinger. Karel has also completed the Principles of Art Therapy Certificate with CTC.